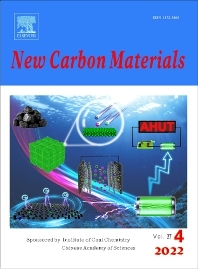 New Carbon Materials publishes original research papers devoted to the physics, chemistry and technology of the organic substances that are precursors for producing aromatically or tetrahedrally bonded carbonaceous solids, and of the materials that may be produced from those organic precursors. These materials range from diamond and graphite through chars, semicokes, mesophase substances, carbons, carbon fibers, carbynes, fullerenes and carbon nanotubes, etc. Papers on the secondary production of new carbon and composite materials (for instance, carbon-carbon composites) from the above mentioned various carbons are also within the scope of the journal. Papers on organic substances will be considered only if the research has close relation to the resulting carbon materials. Benefits to authorsThe Journal provides many author benefits, such as free PDFs, a liberal copyright policy, special discounts on Elsevier publications and much more. Please click here for more information on our author services.